Only 10 chip makers account for 60 percent of the global semiconductor market in 2018, IC Insights reports, significantly up from a 45 percent share in 2008. The top five semiconductor suppliers accounted for 47 of the world’s semiconductor sales in 2018, an increase of 14 percentage points from 10 years earlier. In total, the top 50 chip makers in 2018 represented 89 percent of the total $514.0 billion worldwide semiconductor market, according to IC Insights. That’s an increase of seven percentage points from the 82 percent the top 50 held in 2008. 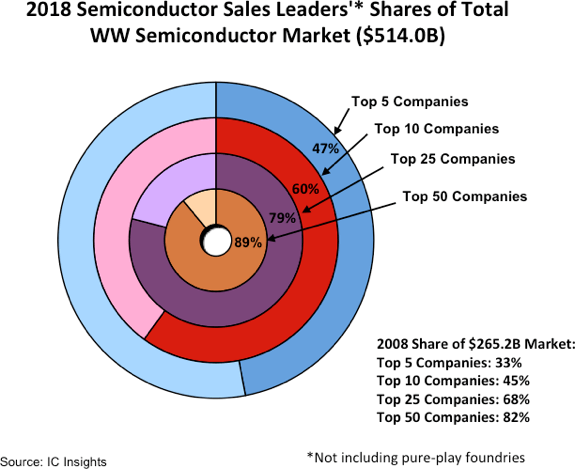 The top five, top 10, and top 25 companies’ share of the 2018 worldwide semiconductor market increased 14, 15, and 11 percentage points, respectively, as compared to 10 years earlier. With additional mergers and acquisitions expected over the next few years, IC Insights believes that the consolidation could raise the shares of the top suppliers to even loftier levels. There was a wide 66-percentage point range of year-over-year growth rates among the top 50 semiconductor suppliers last year, from +56 percent for Nanya to -10 percent for Fujitsu. Nanya rode a surge of demand for its DRAM devices to post its great full-year results. However, evidence of a cool down in the memory market last year was evident in the company’s quarterly sales results, which saw its sales drop from $826 million in 2Q18 to $550 million in 4Q18 -- a 33 percent plunge. Overall, four of the top seven growth companies last year—Nanya, SK Hynix, Micron, and Samsung—were major memory suppliers. Although Nanya registered the highest percentage increase, Samsung had the largest dollar volume semiconductor sales increase, a whopping one-year jump of $17.0 billion. In total, only nine of the top 50 companies registered better growth as compared to the 2018 worldwide semiconductor market increase of 16 percent, with five companies logging increases of more than 30 percent. In contrast, only three of the top 50 semiconductor companies logged a decline in sales last year, with Fujitsu being the only company to register a double-digit sales drop. Rankings of the top 50 semiconductor suppliers, as well as the top 50 fabless IC suppliers, are included in the 2019 edition of The McClean Report, which will be released this month.